1001 CHIHULY, Dale, (American, 1941-): ''Seagreen Macchia Pair'' 2 piece art glass sculpture. From the original pamphlet ''Merlot flecks accentuate the phosphorescent blue green bodies of Seagreen Macchia Pair. A sunny yellow lip wrap gracefully traces the fluted rims of the spirited duo''. Signed on smaller piece, sculpture overall measures approx. 7'' x 10'' x 8'', Plexiglas case measures 14'' x 12 1/2'' x 12 1/2''. Sold with a ''alla MACCHIA'' book with original photograph of piece inside. 1003 GERMAN CARVED & ORMOLU MOUNTED TALL CASE CLOCK: Late 19th to early 20th century, profusely carved oak case with applied ormolu decoration to include masquerons, trim, foliate and floral decoration. Brass dial with Roman numerals, L. Furtwangler & Sohne time and strike movement, double weight, pierced and embossed pendulum. 90 1/4'' h. x 22 3/4'' x 13''. 1004 PICASSO, Pablo, (Spanish, 1881-1973): ''Le Festin'', Plate 6 from Lysistrata, Etching, Full size with margins 15'' x 11 1/8'', impression size approximately 8 1/2'' x 6'', pencil signed lower left, numbered 17/150 lower right, unframed, on Arches watermarked paper. Printed for the Print Club, New York, in 1934. 1010 FINE 19TH CENTURY GERMAN CARVED DESK: Top with removable pediment, single central door with carve decoration and applied cast metal masqueron, single drawer either side. Base with burl walnut veneer writing surface over single full length drawer, carved and turned legs, shaped stretcher with central foot rest. Overall measures 63 1/2'' h. x 39'' x 24 3/4''. 1012 GILT BRONZE ART DECO CZECH PEACOCK LAMP: Gilt bronze figural peacock base with colored and clear crystal swags in tail. Overall 16 3/4'' h. x 15 1/4'' x 7''. 1013 FINE 19TH CENTURY CARVED GERMAN SIDEBOARD: Top with carved decoration over single open shelf over decorated backsplash. Body with single drawer over 2 doors with carved wood panels, applied cast metal lion masqueron pulls. Base with open storage on bun feet. Overall approx. 84'' h. x 43 1/4'' x 23''. 1014 18TH CENTURY EUROPEAN OAK BLANKET CHEST: Hand hewed chamfered paneled tops and sides, front with additional carved decoration. Overall measures 22'' h. x 44 1/4'' x 18''. 1016 19TH CENTURY CHERRY TALL CHEST OF DRAWERS: Mid to late 19th century, 3 drawers over 2 drawers over 4 graduating full length drawers. Fluted styles, replaced heavy bracket feet. Overall measures 65 3/4'' h. x 43'' x 23''. 1018 1929 BERKEY & GAY ''OLD IRONSIDES'' SIDE TABLE: Single drawer side table, only 100 of these were made. Plaque inside drawer certifies limited edition with relief carved American Eagle, hand carved from the deck of the US Frigate Constitution, launched in 1797 and recondition at the Boston Navy Ship yard 1929. Also has Berkley & Gay metal tag inside drawer. Measures 29 1/4'' tall, 30 1/4'' x 18 3/4''. 1020 BRONZE FISHER BOY SCULPTURE: ''Ein Guter Fang'' A Good Catch, old brass label with title and ''von W. Iffland'', sculpture 14 1/2'' h., 17'' overall. 1021 LEVE, Andre, (French, 1917- ): ''L'Enfant Au Chat'', Expressionist Portrait, Oil/Canvas, 23 1/2'' x 23 1/2'', signed upper right, signed on canvas verso, several exhibition labels, heavy carved and painted frame, 35 1/2'' x 35 1/2'', very heavy impasto. 1024 19TH CENTURY CHERRY TALL CHEST OF DRAWERS: Mid to late 19th century, 3 drawers over 5 graduating full length drawers. Fluted styles, replaced heavy bracket feet. Overall measures 65 3/4'' h. x 43 3/4'' x 21 3/4''. 1025 FRENCH ART DECO WALNUT CARVED MARBLE TOP SIDE CABINET: Back with central mirror surmounted either side by glass shadowbox display boxes with single shelf and mirrored backs. Marble top over central drawer over door. 2 side doors with carved decoration at top. Measures 69 3/8'' x 60'' x 21''. 1026 FIGURAL INSECT PORCELAIN OIL LAMP: Stippled egg shaped body with applied figures of cricket, ladybug, and fly, gnarled tree branch form base. Marked simply 345. Unmarked brass font, no shade. Overall 8 1/2'' h. x 4 1/2''. 1027 VICTORIAN CARVED COURT CUPBOARD: 3 door top with applied decoration & carved panels featuring foliate scroll, fruit and figural dragon heads. Backsplash with shallow shelf, turned supports. 2 drawer over 2 door base with carved panels, bun feet. Approx. 93 1/2'' h. x 59'' x 22''. 1030 MATISSE, Henri, (French, 1869-1954): ''Symbolic Landscape: Ethica'', Etching, full size with margin 16 1/2'' x 12 1/2'', impression size approximately 11'' x 8 3/4'', pencil signed lower right, numbered 117/150 lower left, titled in the lower left corner, unframed. From a Portfolio of six signed proofs done to illustrate the six episodes in James Joyce's Ulysses printed by the Print Club in New York, 1935. 1031 MATISSE, Henri, (French, 1869-1954): ''Aeolus, Cave of the Winds'', Etching, full size with margins 16 1/4'' x 12 1/2'', pencil signed lower right, numbered 117/150 lower left, titled in the lower left corner. From a Portfolio of six signed proofs done to illustrate the six episodes in James Joyce's Ulysses printed by the Print Club in New York, 1935. 1032 MATISSE, Henri, (French, 1869-1954): ''The Circe Episode'', Etching, full size with margin 16 1/8'' x 12 1/2'', impression size 11'' x 8 1/2'', pencil signed lower right, numbered 117/150 lower left, titled in the lower left corner, unframed. From a Portfolio of six signed proofs done to illustrate the six episodes in James Joyce's Ulysses printed by the Print Club in New York, 1935. 1033 MATISSE, Henri, (French, 1869-1954): ''The Episode of Nausicaa'', Etching, full size with margins 16 1/4'' x 12 1/2'', impression size 11 1/4'' x 9'', pencil signed lower right, numbered 117/150 lower left, titled in the lower left corner. From a Portfolio of six signed proofs done to illustrate the six episodes in James Joyce's Ulysses printed by the Print Club in New York, 1935. 1036 KITTINGER D1801 MAHOGANY DINING TABLE: Double pedestal base with 4 turned supports each, fluted splayed legs ending in brass caps and castors. Overall measures 29'' h. x 72'' x 48'', sold with 2 18'' leaves. ''Kittinger Buffalo'' stamp. 1037 6 FRENCH SILK SIDE CHAIRS: Shaped backs with tufted ivory silk, back sides tacked with cast metal handles. Overall measures 37 1/4'' h. x 25'' x 26 1/2''. 1037A SET OF 4 SIDE CHAIRS: Shaped back, turned top rail and front legs, ivory floral pattern upholstery. 36 1/2'' h. x 21 1/2'' x 23 1/2''. 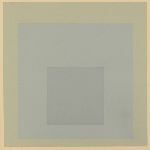 1038 ALBERS, Josef, (German-American, 1888-1976): ''Silent'', homage to the square in gray tones, Serigraph, sight size 12'' x 12'', signed lower right and dated '65, titled lower left and numbered 10/120, Kulicke frame, 18 1/2'' x 18 1/2''. 1039 BUFFET, Bernard, (French, 1928-1999): ''Hotel Am Kanal'', Drypoint Etching, sight size 20 1/4'' x 26'', signed lower right, numbered lower left 57/75, fine frame, 29'' x 34''. 1041 VICTORIAN CARVED COURT CUPBOARD: Top with pediment with gallery, applied decoration over 3 carved panel doors with fruit and foliate motifs. Backsplash with shallow shelf, turned supports. Base with 2 drawers over 2 doors with grape vine panels, bun feet. Overall 99 1/4'' h. x 60'' x 22 3/4''. 1046 18TH CENTURY CARVED FRENCH CABINET: Profusely carved all over, crest with figural eagle finials, shield designs over paneled bask with busts and dragon designs. Open shelf with gallery over single door with heraldic shield and rampant lions, sides with figural monks and architectural floral designs. Base with open storage, carved feet, overall 86'' h. x 33 3/4'' x 18''. 1047 VICTORIAN MARBLE TOP HALL TREE: Architectural pediment with spire finial, back with pierced work, 8 turned wood hangers, central mirror. Base with marble top over single drawer, cast iron inserts at base for umbrella stands. Overall measures 86'' x 33'' x 12 1/2''. 1048 CAUCHOIS, Eugene Henri, (French, 1850-1911): Floral Bouquet in a Vase, Oil/Wood Panel, 6'' x 4 5/8'', signed lower right, carved and gilded frame 14'' x 13''. 1050 VICTORIAN CARVED MARBLE TOP SERVER: Carved and shaped back with applied decoration, 2 open shelves with shaped supports and 2 mirrors. White marble top over 2 drawers with glass pulls over 2 doors with applied fruit decoration. Measures 63 1/2'' h. x 55 3/4'' x 20 1/2''.